Low cost energy storage with an increased lifetime promises to play a key role in the modernization of our nation’s electricity grid. Future grid development will likely require large scale energy storage that not only enables the integration of increasing amounts of renewables and distributed generation, but also improves the grid’s operating capabilities, enhances reliability, allows deferral of infrastructure investments, and provides backup power during emergencies. To expand the benefits of grid energy storage, electrochemical storage systems must match both the time and energy scale of intermittent renewable energy sources while minimizing impact on the cost of power delivery. Developing technology for large scale energy storage is difficult because of extreme cost constraints. The Department of Energy (DOE) has set cost targets for its widespread adoption at $100/kWh for capital and a $0.025/kWh per cycle over lifetime. A flow cell generates power by pumping the electrolyte through the electrode/membrane stack. Duration of power generation increases with the amount of available electrolyte, or the size of the electrolyte storage tank. The incumbent flow battery technology is the all-vanadium flow battery, but vanadium is expensive. The aqueous iron/iron (Fe/Fe) system is a low-cost alternative that requires less ancillary safety equipment. Existing Fe/Fe cells tend to feature a hybrid design, plating iron metal directly on a two-dimensional, flat-surface negative current collector plate electrode. As such, a hybrid Fe/Fe flow cell may encounter capacity limitations due to the surface area of the negative electrode. Cell capacity can increase significantly when plating occurs on three-dimensional (3D) carbon particles instead of a flat surface. This is the objective of this Case Western Reserve University (CWRU) project. While the 3D approach (Figure 1) is fundamentally sound, there are several barriers to practical implementation, such as the maintenance of slurry rheology at different states of charge over long periods of time and the uniformity of deposition onto flowing particles. If successful, CWRU’s design should enable long duration storage with abundant, inexpensive, and safe electrolytes in a fully scalable design. The key to CWRU’s project is the capability to reversibly electroplate iron metal (Fe0) at high power on carbon particles suspended in the flowing liquid electrolyte. The CWRU researchers calculated the requisite current densities as a function of the slurry particle specific area and electrical conductivity. Balancing the competing trends of sufficient particle concentration for high power versus too high a concentration, which leads to slurry solidification, is crucial. This fundamental understanding helped researchers select a commercially available, low cost carbon material that provides sufficient electrode conductivity for efficient battery operation at low viscosity for acceptable pump losses. Critically, this slurry does not settle when flowing or at rest, and changes in the particles over the full range of state of charge do not negatively impact the slurry rheology. The team was able to design a relatively low solids loading of carbon slurry, which can support electron transfer in the region near the current collector surface, but not on the current collector. Their ability to utilize the slurry electrode near the current collector creates an enhanced reaction zone that uniquely enables high-power capability of this electrode stack. Additionally, CWRU developed a low-cost separator specifically for this unique slurry-based system. In related work sponsored by DOE’s Office of Electricity and Energy Reliability, they addressed the parasitic hydrogen evolution issue through a hydrogen recombination concept that maintains the electrolyte balance. 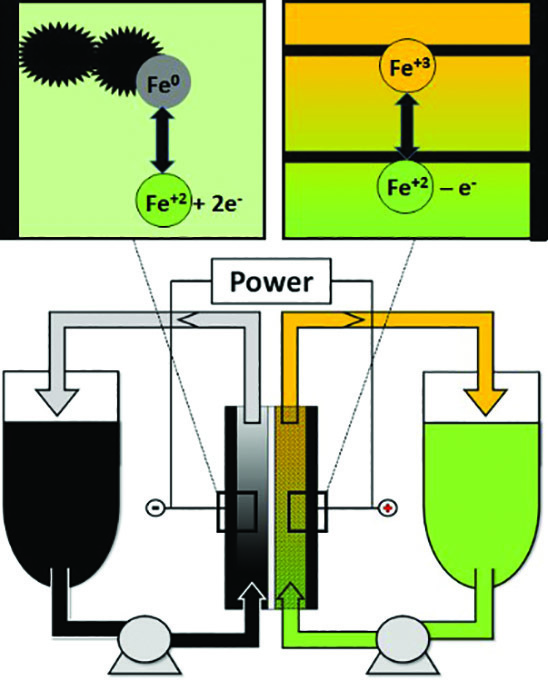 These complementary efforts enhance the viability of CWRU’s iron flow battery. The final deliverable for this project will be a 1 kW, 6 kWh slurry flow battery (six-hour duration), with a complete balance of plant ready for third-party testing. This all iron flow cell chemistry is low cost, non-flammable, and non-toxic. This combination makes it suitable across a variety of application scales, ranging from distributed energy storage in commercial and industrial buildings to very large, commodity grid-scale storage. Moving beyond the academic bench, CWRU has partnered with Fusion Power Systems (FPS), an Australian energy storage provider. FPS has licensed the CWRU technology and is working closely with CWRU on prototype demonstrations—building the same devices on both continents. FPS intends to leverage its own investments, expertise, and market knowledge to develop a commercial product that can be sold globally. The success of this project can help the United States lead in an expanding global market. CWRU’s iron slurry flow battery is among the first full flow battery systems utilizing a low cost and safe active material. The successful application of a slurry cell design and the development of approaches to address chemical imbalances and incorporate lower cost materials have overcome the two most serious barriers to commercial applications of flow batteries for grid storage. CWRU’s results will help position flow cells for larger applications in the grid, which will significantly expand integration of intermittent renewable power sources. As of December 2017, the CWRU project has generated five invention disclosures to ARPA-E. Four U.S. Patent and Trademark Office (PTO) patent applications have been filed on the disclosed inventions, and one U.S. patent has been issued (U.S. Patent 9,559,375B2, Jan 31, 2017) with allowances also granted in Japan, and with actions pending in China, South Korea, and Europe. The CWRU researchers have also published the scientific underpinnings of this technology eight times in the open literature. Nguyen, T, and R. F. Savinell, R. F.(2010) Flow batteries, Electrochem. Soc. Interface, 19, 54. Petek, T. J., Hoyt, N. C., Savinell, R. F., & Wainright, J. S. (2016). Characterizing slurry electrodes using electrochemical impedance spectroscopy. Journal of The Electrochemical Society, 163(1), A5001-A5009.